We hope you'll find this blog an educational, entertaining, and inspiring source of information, whether you're recently undead, a long-time member of the differently animated, or a still-living friend of your fallen, yet risen again, brethren. Everyone with an interest in zombie rights is welcome! After some consideration, the ZRC blog will not be reviewing each individual episode of Fear the Walking Dead this season. It’s simply too draining! All those poor Zombies. Whatever euphemism they come up with next. We support you, Differently Animated! The final episode of ‘Dead Set’ begins with a hastily-averted sniping tragedy and the happy reunion of Riq and Kelly. But can happiness possibly last with such a dysfunctional cast? Is reality television good for you? Can it even get you killed? Looting, violence and angry self-destructive behavior, all that and more on the next episode of ‘Dead Set’! (Also essentially every Zombie Apocalypse story ever. More below the cut). Episode 2 opens with Kelly’s boyfriend Riq being thrust into the alleged Zombie apocalypse (the ZRC strongly disputes this traditional framing). Also, dealing with mass transit during a significant social upheaval. Reality Television. Anti-Zombie media. Two of the biggest and most widely criticized pop-culture phenomena of the last few decades (although, in the Zombie case, we feel rarely for the proper reasons). What would happen if you were to.. combine.. the two? You know a movie is going to happy places when it opens in media res with a scene of a woman screaming in terror in a darkened room. More details below the cut. The penultimate episode of ‘The Walking Dead’s much lamented seventh season had an opportunity to branch out, to be truly different, even inspiring to the Differently Animated community. Instead, well. It went somewhere else. More below the cut. 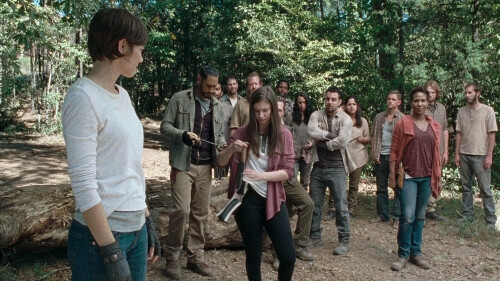 This week’s The Walking Dead has your quota of skulking in the shadows well and truly filled. But first, a training montage! 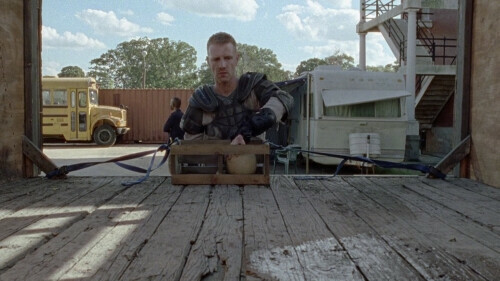 This week on The Walking Dead, we find out just how much mayhem and suffering can be caused by a single missing piece of fruit. It’s all a bit For Want of a Nail, really.